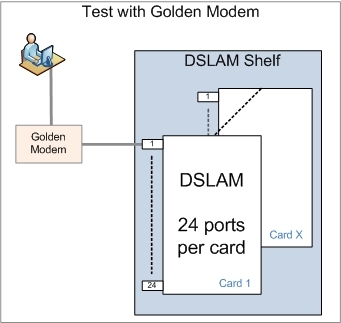 The only accurate method of checking a Digital Switch Line Access Switch (DSLAM) port is by connecting it to a Golden Modem. This will prove the DSLAM port is functioning correctly and can communicate with the Modem. 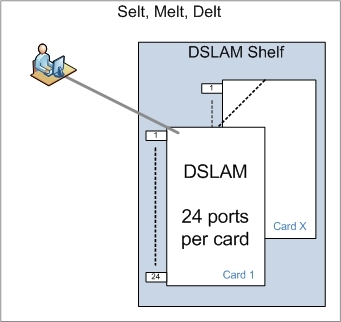 Once the port is proved to be okay the fault has to be on the customers equipment, the customers configuration or the line circuit btween the Central Office (CO) and customers premises. Adding a Copper Line Test Head into the configuration can prove exactly where the fault lies on the Copper Line and efficient remedial action can be started. Most importantly these test require a working end to end circuit. If the customer has lost service and is calling to report the fault it is unlikely these tests will prove anything - other than confirm the customer has no service. The results will not identify where the fault is and further analysis is required to prove the fault on the line circuit or customers equipment.